First off I have to admit that I am not the best pet parent in the world, my grooming bag did not contain a dog toothbrush. Luckily Riley and Katie have eaten raw diets most of their lives and we have very little if any plaque build up on their teeth. But for Trixie and Chicky (the Pekingese) it’s a totally different story. Trixie had a complete dental in March, that included extractions, so I knew that it was time for me to step up my game in the dog dental department. Brushing my dogs teeth needed to become a daily part of my habits, just as I brush my teeth. So I started searching for different dog toothbrushes. Unfortunately I came to a quick realization that most dog toothbrushes are made for large dogs so the brush heads are really big which is way too big for a little Shih Tzus mouth. So I resorted to little kids brushes. As fate would have it, one day I received an email telling me all about the Emmi-Pet Ultrasonic Toothbrush and asking if I wanted to try it. I was very skeptical, an ultra-sonic toothbrush that has zero vibration. Hmmm , sounds interesting and if the hype of it being non-vibrating is true, then we’ll have a winner. So I couldn’t wait to try it out on my dogs! When the toothbrush arrived I immediately charged it and turned it on to use. Much to my surprise when it was on there was no vibration. But how could I be sure that this was going to work? I did a little experiment that I thought would give me a little more assurance this was going to work. I placed the toothbrush head in a glass of water. I really thought that if this was ultra-sonic I should at least see some movement of the water. But that didn’t happen. At this point I become even more skeptical. I don’t know about you, but I normally don’t read manuals on how to use something… I figure turn it on and use it, it’s very simple logic. Luckily Emmi-Pet / Emmi-Dent has a video. I was surprised when watching that you don’t brush like you normally would. You hold the brush in place over the tooth and let the ultra-sonic air waves with the special toothpaste do it’s work. Emmi-pet Ultrasound Toothbrush: Cleans the teeth of your pet with 100% Ultrasound Technology! Emmi-pet is the “no-brushing” toothbrush innovation which cleans without any motion, vibration or noise. Your pet will feel no sensation when cleaning his teeth. At this point I am not sure how the Emmi-Pet can work, as I said before, I can be very skeptical. So I decide to try out the Emmi-Pet Ultra-Sonic Toothbrush myself. Yes dog toothbrush and dog toothpaste. OMG!! I just couldn’t believe how my teeth felt after I finished, they felt so clean and polished, almost as if I had just come from the dentist. At this point I knew it would work great on Trixie and Chicky. Yes, it may seem gross, but the special dog toothpaste with nano-bubbles was not that bad. It’s amazing what we will do for our pets sometimes. 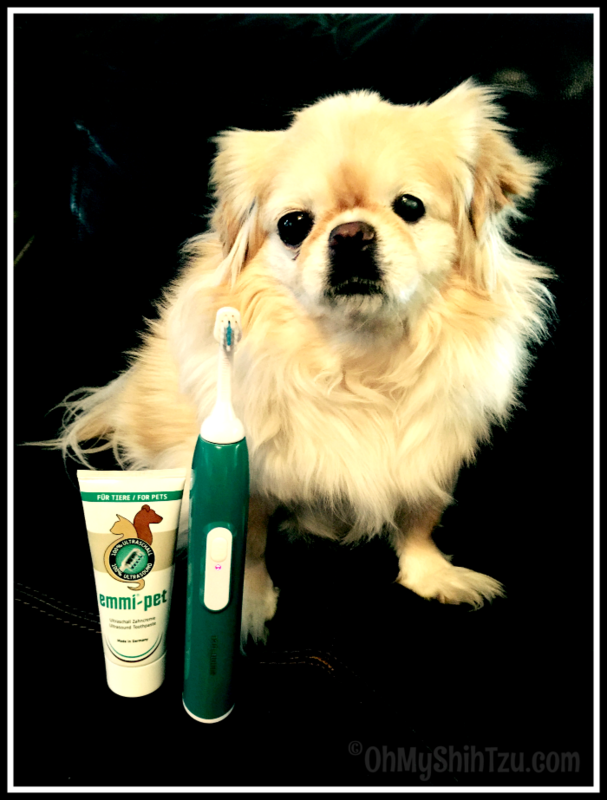 I absolutely am in love with the Emmi-Pet Ultrasonic Dog Toothbrush!!! I have noticed a big difference in my girls teeth since we have been “brushing”. The best part is that they don’t mind! I also believe this is one of the best long-term investments in your dogs health you can get. So two years later I am still using the Emmi-Pet Ultrasonic Dog Toothbrush and absolutely adore it. Links have been updated so you are still able to purchase this toothbrush here in the United States. If you are in Europe or the UK you can purchase the toothbrush by visiting Emmi-Pet Ultrasonic. Disclaimer: This post has been updated due to the response of our readers. There was no additional compensation from the company for this updated post. I still believe in this product and believe this is the best toothbrush for dental hygiene of your pet. The Emmi-Pet Ultrasonic Toothbrush was provided to us for our honest review, we were not monetarily compensated for our review or mention of their product. Please know that we only share what we believe is good for your pet, and in brands you can trust. We believe in honest and truthful reviews to protect you and your family. I must admit that I don’t brush my dog’s teeth. I’m not sure why I don’t? This would make the task so much easier!!! Thanks for the information! Dex gets his teeth brushed nightly and he also has an ultrasonic toothbrush and we love it. I brush the dogs’ teeth with a finger brush. I am working on using the reg, toothbrush but I think that they would benefit more from this ultrasonic brush 🙂 I love that there is no vibration and it’s small enough for little dogs’ mouths! 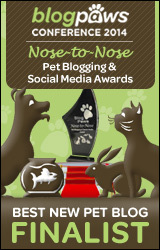 Totally pawesome – we need one of deez, my momma be tired of ‘brusha brusha brusha” three dogs every night!! I do brush the teeth of all my three dogs. One of them is great and the other two are awful. It’s not the easiest. This is the first time I’ve seen this type of brush. No, we do not yet. I do not, we are adopting next month so I will live to do it when we do bring him/her home. 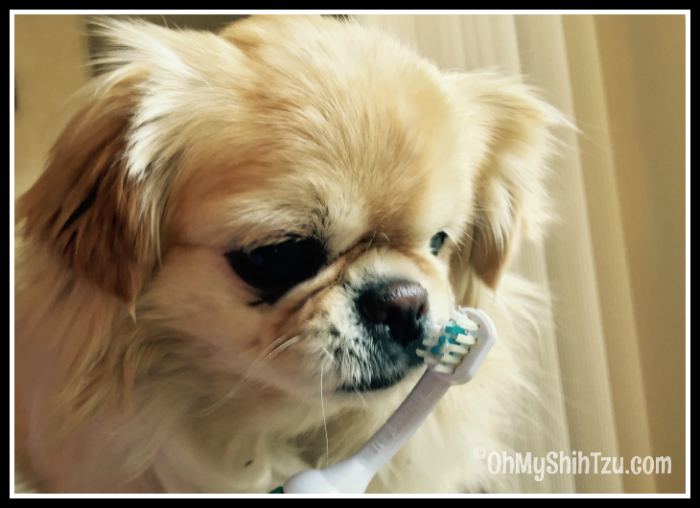 I usually don’t brush my dog’s teeth. I really should start doing it though. I brush my dogs’ teeth every week. The vet is impressed with my 10 year old dog’s teeth. He is not missing any. and his breath doesn’t stink either. My 5 year old dog’s teeth are in great shape now too. When we first got him they were yellow and had some tarter build-up. This is so cool! I love that you tried it out, and I am also not very diligent when it comes to brushing my girls’ teeth. Would love to try this out! The only time Cody gets his teeth brushed is when he is groomed. Guess i need to work on that. Thank you so much for testing this so we don’t have too! Lol!! It sounds like a great toothbrush and maybe Haley would like it more than the one I use now. Sadly, I also am not the best at keeping up with teeth brushing on a daily basis. i have never brushed his teeth. but we”ve been talking about wanting to for awhile now. I would be interested to see if Rooney would like this toothbrush! This is a real human-grade toothbrush. Mr. N has his teeth brushed several times a week. Testing the toothbrush out yourself shows dedication lol! I want one! I want one!! We hardly brush their brush unfortunately.